I wanted to do a weekly quote post. I love seeing and reading a great quote! I love that some are old, some are new. These "What's That Quote?" posts will be anything that caught my attention or really stuck out to me. It may be spiritual, proverbs, literary, or just a fun and quirky meme. Who knows? This is the first post and I am excited to see where it goes. I will try to give my interpretation or how the quote made me feel. Maybe share a bit of how it reflects in my life. We shall see. I hope you enjoy and please share your opinions. I love learning how the same sayings can be interpreted differently.
" It doesn't matter how slowly you go, as long as you don't stop." We all have to go at our own pace. What may come quickly to some, may be a struggle for others to get to the same point. 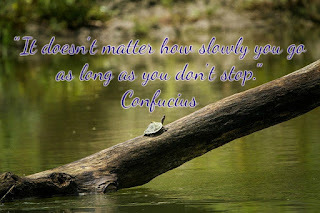 I am learning, with trying to get this blog up and going that I definitely am the tortoise in this race! It isn't that I'm not really trying. It is just taking me a bit longer to get there. I'm slowly learning that it is okay to fall behind all the others speeding past me in the blogging world. Our "races" are different. I'm not stopping. I will get there eventually. I'm just taking a slower route and soaking up all the information along the way! I would so much rather get to the goal with a ton of knowledge that I hopefully can use and pass onto others who have been there, than to speed through, only to reach the prize, having no idea how I got there. How do you feel? Are you the tortoise or the hare? Labels: #1, Confucius, What's that quote?